Father’s day is another one of those days that you could argue is yet another excuse for the likes of Hallmark and other greeting card companies to make an extra bit of profit, but, since its invention in 1910, it has become a day for celebrating fatherhood in many countries around the world. Being a father myself, I quite like Father’s Day, because my two kids seem to make even more of an effort over it than they do my birthday. So, for all the dads out there, and any kids who might be interested too, here are ten facts about Father’s Day that you may not have known. When Father’s Day was first introduced to the American public in 1910, it was met with derision and seen as just another invented special day like “National Chocolate Day”. The person credited with the invention of Father’s Day is Mrs. Sonora Smart Dodd, who wanted to celebrate her own father who had raised his six children as a single parent. In Germany, Father’s Day, or Mannertag, is celebrated in style. Dads on Father’s Day in Germany get treated to a day of fine food and copious amounts of beer. That sounds a lot better than the card and gift we get in England! The day has become so much of an alcohol fest, that police are put on high alert and there have been calls to ban the celebrations altogether. If you are looking for Father’s day Gift ideas, then how about some flowers? Be careful of which flowers you choose, though, because traditionally, Red roses were used to signify a living father and white roses were used for a dead father. Father’s Day in Thailand is always celebrated on the same day as the Kings Birthday. The people of Thailand honour their father, or Grandfather, with a Father’s Day gift of a flower called a Canna flower, which is considered to be a masculine flower. When a Father’s Day was first proposed as a National holiday in the US by President Woodrow Wilson in 1913, the idea was resisted by congress. It was President Lyndon B. Johnson, who issued the first proclamation that fathers would be honoured on the third Sunday of June and it was President Nixon who made it law in 1972. The oldest recorded man to have fathered a child was an Indian farmer named Ramjeet Raghav. His 52 year old wife gave birth to a child when Ramjeet was 96 years old Now that’s going some! The man who has been recorded as having fathered the most children ever, was Feodor Vassilyev, a peasant who lived in Moscow and died in 1782. He was said to have had 69 children in all and his first wife gave birth to four sets of quadruplets, seven sets of triplets and sixteen pairs of twins. Although there is some debate as to exactly where Father’s days lies in the league table of the biggest days for greeting cards a sale, it is thought to the fifth best day for being a card retailer. Only 50% of the cards are bought by kids for their own father though. The rest are bought for grandfathers and by the wives, or partners. 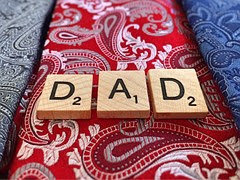 It would seem that children and mums aren’t too imaginative when it comes to buying Father’s Day gifts and the good old necktie is still the most popular gift. That’s followed closely by car accessories, personal care products and sporting accessories. Some of the pedantic grammar Nazis out there will be happy to point put that we all write Father’s Day incorrectly, with the apostrophe in the wrong place.